In Ireland we are very fortunate to have a country steeped in history. This history is captured in the hundreds of medieval sites across the country. 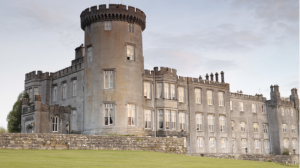 We at Atlantic Way are very proud to bring you on our luxury Historical Tours Ireland where we have roughly 1300 Castles and most of these castles have a surname or clan associated with them so we can find your ancestral home!. At Atlantic Way we can create an itinerary to ensure you visit as many of these castles as time permits. Many of these castles are now luxurious hotels. We can offer a tour to visit castles and stay in castles giving the ultimate heritage experience. Ireland’s two most popular castles are Bunratty Castle and Blarney Castle, and these are also two of the most visited tourist attractions in Ireland, outside of Dublin. Bunratty is located in County Clare, close to the River Shannon and Shannon Airport. This castle is famous for its medieval banquets that for many visitors to Ireland, from the United States in particular, present a great last night in Ireland before returning home via Shannon Airport. Bunratty Castle dates back to the 14th Century and once belonged to the O’Brien Clan, who were the High Kings of Munster. Today the castle forms the centrepiece of an excellent Folk Park outlining Ireland’s history with a recreated 19th Century Irish town. Blarney Castle in County Cork is home to the famous Blarney Stone which, according to legend, bestows the gift of eloquence and Irish charm – or as we say; “the gift of the gab”. For years countless numbers of people have descended on this 15th Century castle and climbed its tall tower to kiss the blarney stone. Most of Ireland’s large castle residences are now lavish castle hotels that have entertained dignitaries from Princes to Presidents. Ashford Castle and Dromoland Castle are two of Ireland’s leading and most luxurious hotels. Situated on the banks of Lough Corrib in County Mayo, Ashford Castle is a majestic building of Victorian neo gothic architecture, though the castle’s history dates back to 1228 when it was founded by the Anglo Norman de Burgo family. The Guinness family also owned Ashford Castle and the castle has hosted the Prince of Wales George V and President Ronald Reagan on his state visit to Ireland. We visit all the more spectacular sites such as New Grange and The Rock of Cashel. We also like to bring you to the special ones which are off the beaten track to give you a true sense of old Ireland. Get in Touch now so that we can help you start planning your itinerary for your luxury Historical Tours.